Wyatt Earp was a snowbird. Last week, archivists at the Father Andrew P. Kashevaroff Alaska State Library, Archives and Museum announced the completion of a project to digitize a collection of papers relating to the Western gunslinger’s time in Alaska. Earp and his wife were among the tens of thousands of people who came to Alaska and the Yukon during the Klondike Gold Rush, but after an abortive attempt to reach the Klondike via the Yukon River, Earp focused instead on mining the miners. He opened a high-end saloon in Nome and operated it with partner Charles Hoxie. “With the gold rush settling in there in Nome, he figured he could make money selling beer to miners,” said archivist Zach Jones, who digitized the records. By the time Earp left Alaska for good in fall 1901, he did so with more than $80,000 in his pocket. The money didn’t last Earp or his wife long, but memories of Earp’s stay have lingered, particularly in Juneau. On Friday, with tourists filling the sidewalks on South Franklin Street, Mike Baty of Dallas, Texas, walked through the swinging doors of the Red Dog Saloon and held up his camera to take a picture of the plaque behind the bar. Earp’s handgun, left behind because he had to catch an early morning steamship westward, remains a reliable tourist attraction in the capital city. Baty said he’s a fan of Western history and gunslingers including Earp and Bat Masterson. “I’m from Texas, and it’s just a real part of Western history,” he said of the gun on the wall. Red Dog general manager and partner Eric Forst said Baty isn’t alone in his interest. At the state museum, Jones said Earp “has a name,” and visitors have requested documents from time to time. “We figured, let’s just put them online,” he said. 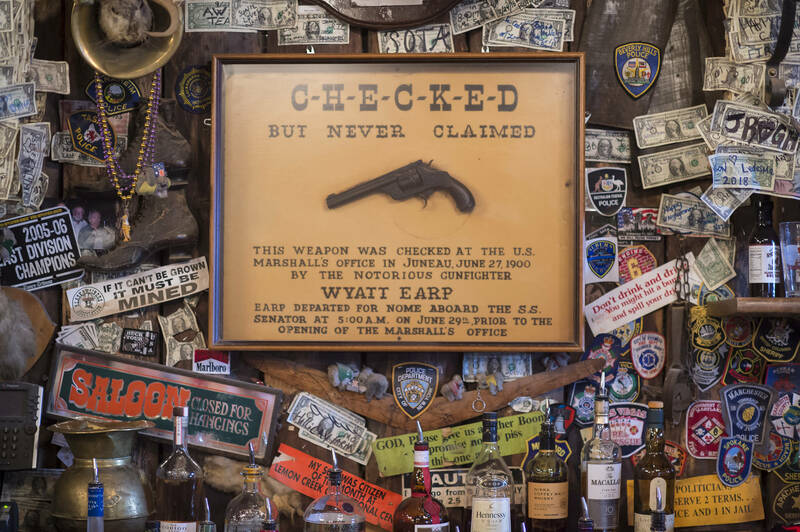 The documents now online include materials relating to liquor licenses and legal matters relating to Earp and the Dexter Saloon, which Earp and Hoxie operated. Earp and his wife Josephine came to Alaska in 1898 with the first major surge of Klondike goldseekers after being delayed by health problems in San Francisco. That year, they traveled the Yukon River route, but the river froze and stranded them in Rampart for the winter. They headed downriver with the spring thaw, and Earp sold goods for the Alaska Commercial Company before a friend convinced them to move to Nome. In 1899, Earp partnered with Hoxie to build the Dexter, a “better class” saloon, according to historian Ann Kirschner. Rather than overwinter in Alaska, they traveled south to California, where they acquired better furnishings for the Dexter. They headed north in early summer, and it was on that trip that Earp left his pistol in Juneau. According to the story recounted in “Alaska State Troopers: 50 Years of History,” Earp was confronted at the dock by the deputy U.S. Marshal and a delegation from the town. That group, knowledgable about Earp’s reputation, forced him to leave his weapon in the custody of the marshal. The marshal’s office didn’t open until 9 a.m., and Earp’s boat left at 5 a.m.
Court records show Earp had some minor run-ins with the law in Nome, mostly regarding drunkenness and fighting, before again leaving for the winter. Earp stayed one more summer in Nome before departing, never to return to Alaska again.